Big Hero 6, based on an obscure Marvel comic of the same name, continues Walt Disney Animation Studios’ recent success streak by merging big action and sublime visuals with a wealth of heart. Young robotics whiz kid Hiro (Ryan Potter) forms an unlikely superhero team of science nerds and a loveable med-bot (Scott Adsit) in an effort to defend San Fransokyo from a masked villain whose emergence has cast a bleak shadow across his life. The aforementioned plot outline may not strike much enthusiasm, and it’s acceptable to say that Big Hero 6 careens across a well-piled pathway, particularly towards its final act. But then it’s also wonderfully written and enriched with style and wit by the bucket load. The characters are rounded (even Baymax, the med-bot who becomes somewhat of a surrogate brother figure to Hiro, while also scoring many of the films funniest scenes), and the screenwriters ensure there’s panache around every corner. And that’s not all, as the animation is superb, too, with one breathtaking set piece after another. 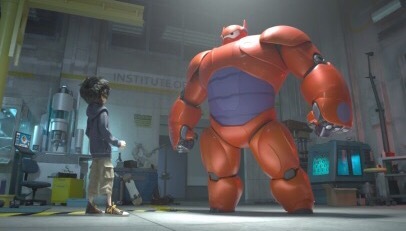 Even in spite of its surface level predictabilities, then, Big Hero 6 is huge, showy fun, but never at the expense of its softer, touching underside.